early sunday morning, while my nape still hurt from the blistering heat of the previous two days in puerto galera for our office outing, i got up and looked out my window. i caught buendia in the half light of 5am, and i noticed that there weren't any of the conspicuous EWDs of the previous run that traversed this important artery, so i wondered whether the condura run had been cancelled, or they had taken an entirely different route at the last minute. i consulted the map of my race kit and confirmed that it would pass this way. so i washed up, laced on my running shoes, put on my helmet, slung my nikon D300 on my shoulder, and pushed my bike out the door. yes, i was going to participate, in some way or other, in the condura skyway run for the whale sharks, a sly tactic of concepcion industries to cover up for the fact that they make silent polluters: aircons and refrigerators. i suppose it was some way of earning carbon credits. anyway, i had signed up for the 21k event of this run, and although i had been under worse conditions during my last half marathon, i decided to skip this one in favor of a better opportunity: to photograph the skyway. 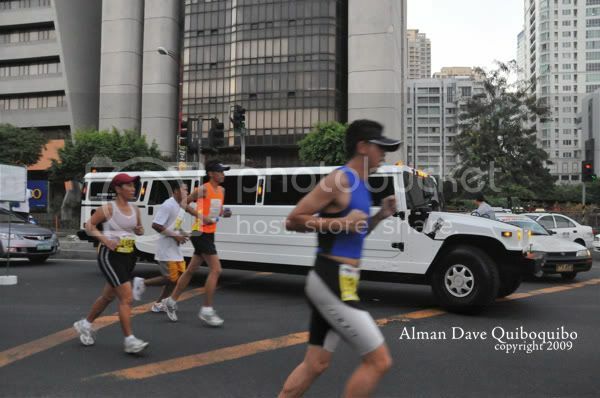 at half past 5, i was already chatting with organizers at the corner of reposo and buendia, the turnaround for the 10k, and they said that the race had started, and the lead pack was already approaching kalayaan flyover. 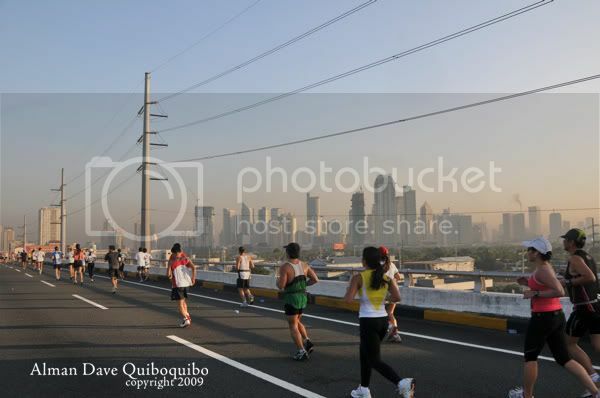 i was already armed with my camera, although the eerie dawn which slowly crept over makati prevented me from getting any decent shots of this small platoon that led the race. pretty soon, the normal runners, those who run just below 6 minutes per kilometer, began to fill the road, and the intersection was closed for good. this obviously irked many car drivers, who honked incessantly and continuously, as though they owned the road. i absolutely hated having to be flooded by the sound of cars, and i gave some of them the dirty finger. there was murder in the eyes of some of these drivers, and i was almost sure some of them may have been inclined to plow down the runners. 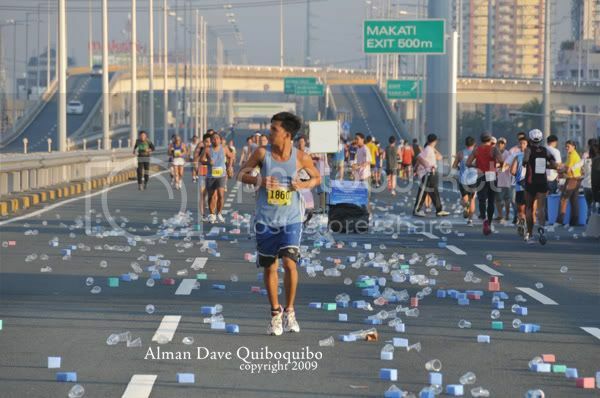 i suppose they failed to appreciate the significance of the run, not just because it was for the conservation of whale sharks, but for all the other benefits of running: both to the health of the individual, and to the health of the environment. 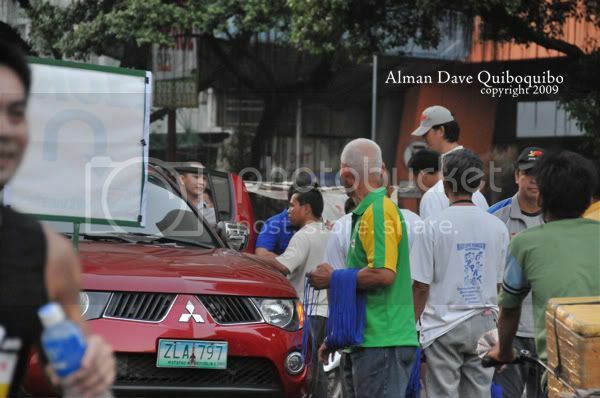 eventually, some of the irate drivers finally confronted the traffic enforcers and the organizers who handed out strings, and apparently, a verbal tussle ensued, and soon finger-pointing began, and people had to be restrained. i managed to get a photo of the vehicle that carried the irate non-runners. now i don't know really how they nearly came to blows: the organizer may have said something not-so-nice, or the non-runner may have wanted to throw his weight around. 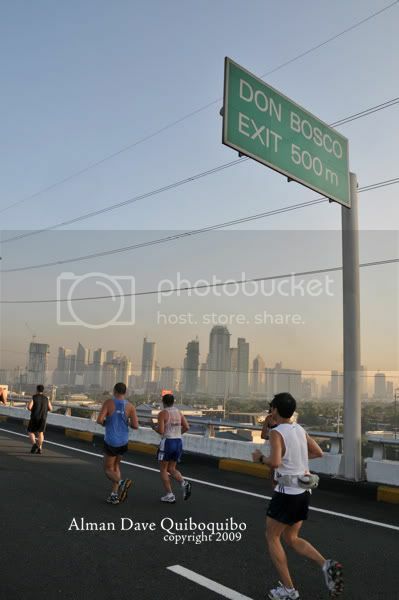 but the situation could have been assuaged by proper notice: rudy biscocho could have placed notices along kalayaan flyover and buendia that portions of it would be closed to traffic from 5:30am until 8am for the condura run, suggesting alternate routes. but none of that was done. 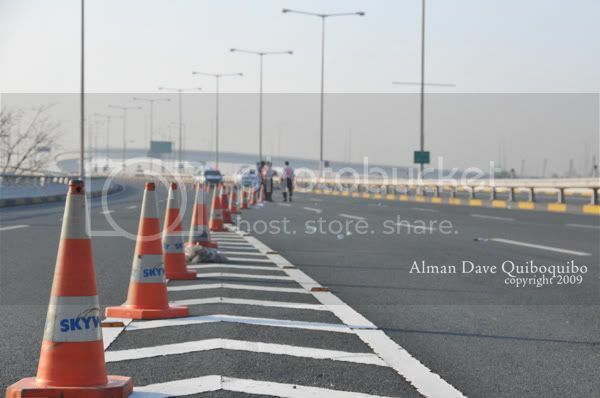 and for the drivers, they could have just tried to appreciate the activity. it wasn't like there was an emergency and they needed to get to the hospital! 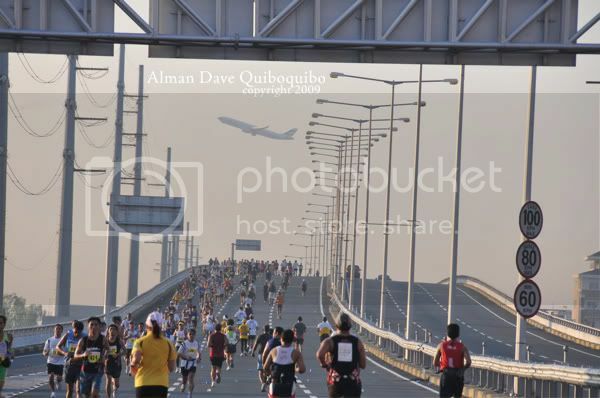 after a while, i cycled all the way to the foot of the skyway, chained my bike to a concrete barricade, and then wore my bib number which magically appeared (just in case they didn't allow non-runners up the elevated highway), and began running, sometimes theatrically. i paused often to shoot scenes you don't normally see. it really was a rare opportunity, since pedestrians are not normally allowed up there, and although i do not doubt you could take pictures of the skyway, you'd have to do it on a moving vehicle, which robs you of creative freedom. but running isn't exactly ideal for much reflection and composition either. 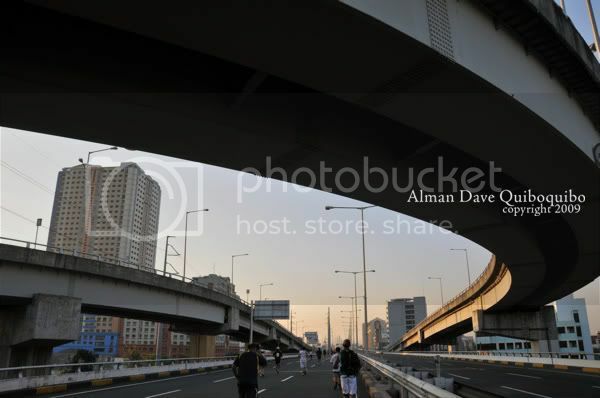 the skyway portion was actually pretty short: it began at the buendia on-ramp and lasted only until the magallanes exit, a loop which more or less covered just 6km of the entire route from fort bonifacio. at first i thought: wow, citra (the builders of the skyway) may have agreed to sponsor the event at great cost to its operations, but then i realized they may not have lost that much business since the skyway doesn't get much patronage from vehicles, really, heavy traffic and inconvenience be damned. although it is a highway in the sky, i noticed that going up the skyway isn't so hard, and its smooth asphalt surface is ideal for runs. plus, it responds to the thousands of foot falls. whenever i paused to take pictures, i felt it moving. nevertheless, there are no trees up there so it was punishment of the worst kind -- some participants may have courted with sunstroke! the views from the skyway are fantastic. of course, i see the metro on a daily basis, but the perspective from this piece of infrastructure is almost surreal, with the skyscrapers of makati and ortigas rising from the collective soot of the exhausts of millions of vehicles, piercing the gray-blue sky with their ominous silhouettes. i was lucky enough to have captured planes taking off from the runway of MIA, and trains passing by under the skyway. but i also confirmed something else: that billboards are awfully ugly, every single one of them should be taken down. by the time i had reached my bike at the bottom of the on-ramp, only about 5 other runners were behind me. some of them were already walking, and appeared to be in no condition to continue running for the remaining 8 kilometers. i was only too happy to be cycling my way back home, with my camera, which nearly broke my wrist, slung on my shoulder. 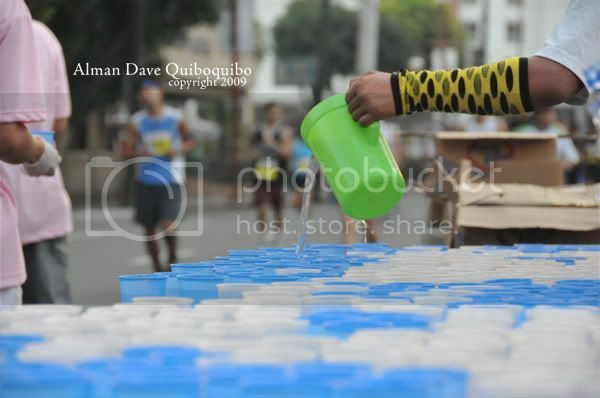 for more photos of the event, visit my multiply. Naiingit ako sa mga pictures!!!! salamat! sana sumama ka! it's fun to shoot races din. there's one almost every weekend. this is great stuff! great recap from the perspective of someone who dint run the course! i like the 3rd to the last pic! great work! thanks lester for your generous comment. the photo with cathay pacific's A320 (this is a wild guess) was a bit hurried and i nearly panicked when i saw it, so that explains the sloppy framing. i just got 3 pics of the scene, and was lucky i got it with the bird right in the middle. or maybe not. my wrist is injured. haha. i take offense regarding the sly tactic of concepcion industries - first of all our products are non - cfc free and energy efficient. in fact our refs which i am the president off are the most eco friendly refs in the philippines - far exceeding the global standards on cfc. in fact we are the only ones who are non cfc up to the mfg process far ahead of the 2010 regulations. what we need to do is to build a positive environment for a great philippines and avoid the filipino crab mentality and putting people down. your pictures are fantastic. i love your picture on the skyway. you have a talent and thanks for sharing this with us. hi ton, i apologize for the familiar tone, but then again, i'm just like that. before i respond to your comment, let me just marvel at the internet and wonder how internet traffic must have taken you to my site, out of many that blogged about the condura run. having said that, let me express my apologies at the rather general comment i made about aircons and refs -- i appreciate the fact that you've corrected me on the fact that concepcion industries' products have exceeded international thresholds on CFC and carbon emissions. this really shows how ignorant i am about the specifics on your products, and i humbly admit my failure to do any thorough research. nonetheless, i think that we are all polluters -- even breathing itself creates pollution, as i understand -- and that is why i firmly believe in earning carbon credits, and salute the concepcion industries for its efforts to promote healthy and environment-friendly activities. i regret not having taken part in your first run which supported the tubbataha reefs. it is evident from the text that i congratulate concepcion industries for its corporate social responsibility, particularly in the field of nature conservation -- something i am extremely passionate about. just to illustrate how i supported this event, i registered more than 20 of my friends at your office along malugay, which is a stone's throw from where i work and live. that shows that despite what i've said about the "sly tactic" (an exaggeration, i must confess), i was eager to see the success of the event, particularly because i have personally encountered whale sharks myself. I think we are party to the convention on phasing out CFCs and similar refrigerants, but their fluorinated replacements are still greenhouse gases. What are the safeguards in the statutes Alman and which parties are covered by these? What happens when refrigerators die? I only see guys hauling them to be sold to the scrap yards but beyond that I don't know what happens. Are the manufacturers bound to recover/recyle/re-export the F-gas in them (if they had not escaped by then)? yeah you should cuz you have nice pics!! well done!